If you want to get on in journalism, taking a degree course can be a great way to get an education and prove your ability at the same time. But just what does a journalism degree involve? We visited the University of Strathclyde in the company of current journalism student Andrew Robertson to find out what it's all about. "I was attracted to the course at Strathclyde because it includes NCTJ certification," says Andrew. The NCTJ is a professional body which offers a variety of courses to journalists and can make a big difference when it comes to getting a job. Andrew had already worked as a writer for various publications but wanted something on his CV that would be 'directly useful' when applying for any job in the industry. 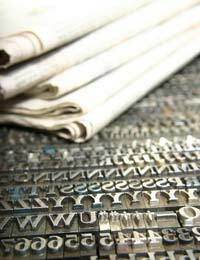 The Strathclyde journalism degree is broken down into three main strands: journalism (news writing, research etc. ); creative writing (focusing on technique and literary awareness); and a combination of the two, aimed at building an awareness of the context in which journalists work. There is also a series of short modules which students can select from in accordance with their particular interests. "Most people did politics or economics," says Andrew. "There was stuff about communication theory which I thought was very useful. "I did those, plus French, because I thought that would give me a relatively rounded mix. I was intrigued to study politics. A lot of the stuff that interests me, like news theory and literary theory, was immediately relevant in politics, and the department was very helpful." Despite this rounded approach, Andrew was concerned that the course did a better job of preparing people to fit into the journalism industry than of teaching them to work independently, and he was also concerned that parts of it were out of date. "One of the major problems is that there are few texts considered as seminal to journalism as Tom Wolfe's 'The New Journalism', and that's well over thirty years old now. The state of the art of journalism has changed significantly." Strathclyde's journalism course is four years long, so it requires a big commitment. It's structured so that all students have to take another major subject alongside it - Andrew chose English - so that they'll have at least one specialist area to work in when it comes to finding a job. This means that it's not all work and no play. There's room to pursue personal interests and study favourite subjects, as Andrew did when he chose Victorian and Gothic literature in his third year. Despite the increasing number of journalism students out there, there's still a limited number of industry jobs. How flexible is a degree like this in terms of the options it gives to a graduate? "The things the course teaches are useful in other fields," Andrew says. "I've found that they've helped me with communication and also with technical writing. But most of all I enjoy writing to an audience - that's why I write - and the degree was good at teaching that."